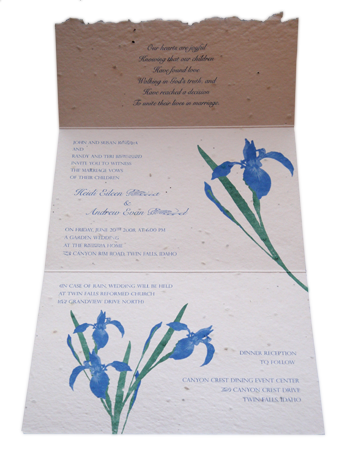 Celebrate your special day with customized Wedding Invitations made with handmade paper from Green Field Paper Company. Allow us to custom create your invitations, or purchase blank card stock and make your own. We print using either offset printing with eco-friendly soy inks, or letterpress style. If you choose any of our seed embedded papers for your invitations, you have the option to go the extra mile for your guests: have the growing instructions printed on the back of each card! Friends and family will be fascinated when they learn that they can actually plant the invitation, and watch it sprout and grow into wildflowers.